And seasonal gifts like GingerBread Kids Cakelet Pans are useful (if you can call them that) a tiny portion of the year, and are exactly the kind of thing you donate when you move because the idea of putting time and effort into packaging and transporting something so trivial makes their absurdity very apparent. (Pro tip – Goodwill is full of cakelet* pans for real cheap right now!) Give kitchen gifts that people will box up last, and unpack first when they move into a new place. I love these three items so much I brought them with me to cook Thanksgiving last week. They reduce effort and waste, are constantly useful, and are useful for cooks of any skill level. Like last year, I’m linking to examples but it’s not the specific brand that is important here. *I was not aware cakelet was a word until I found this pan. When did cakelets become a thing??? 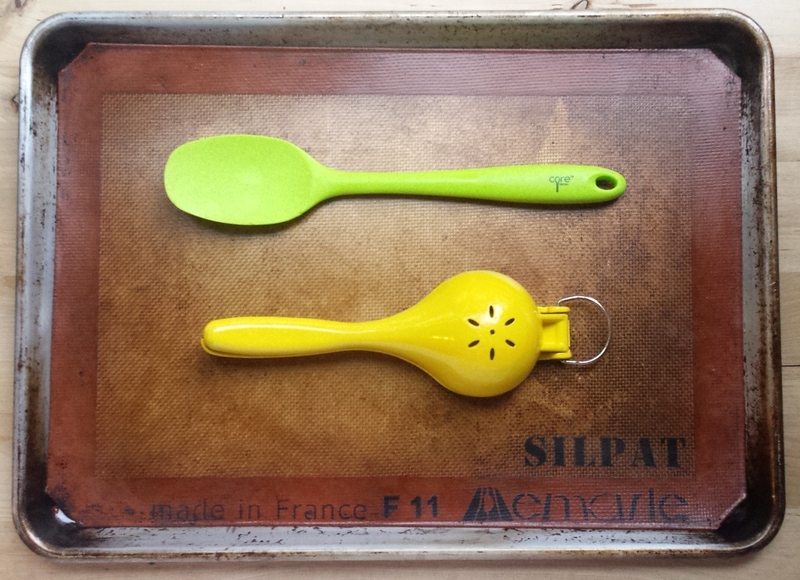 Silicone spatula – I especially like the models where the spatula is one piece (not a head with a handle made from another material). They wash nicely, and there is less chance of the head falling off or weird gunk getting stuck. I probably don’t need to tell you these are essential for wiping down the sides of the food processor and getting every last drop out of measuring cups, bowls, and pans. Owning one is rarely enough. Citrus squeezer – Yes, you can try squishing citrus on the counter with your palm or microwaving it to get more juice out (or squishing then microwaving, which Robert Wolke found in What Einstein Told His Cook to provide the highest juice yield). But those methods only make citrus easier to juice if you are doing it by hand. I find this low tech squeezer to greatly magnify my squishing power with its leverage and pressure. As a bonus feature it keeps almost all the seeds out of whatever you are making. I do also have one of these juicer/strainer combos that is better for larger citrus and/or higher quantities (read: cocktails), but I keep one of these squeezers readily accessible for my daily needs. Silicone baking mat – I never want to go back to my life without this. I don’t even remember the last time I made cookies that stuck to the pan. Use it in any recipe that calls for parchment paper or a foil lining of a baking sheet. Nothing sticks, ever. I’ve had this one three or four years and yes, it is a bit weathered, but no worse for the wear. I use it for roasting tofu, crackers, cookies, rolls, and anything that threatens to be sticky. If you are looking for even more ideas, I keep a board of items on Pinterest (but some are more dream items than small gifts, and since I don’t own them I can’t officially endorse). What are other hyper-useful gift ideas for the home cook?